The University of Oregon Allan Price Science Commons and Research Library was designed by Portland, Oregon-based Opsis Architecture. Principal architect on the project, Jim Kalvelage (UO ’81) says his team was inspired by school ties and a collaborative spirit. Kalvelage commented, “The Opsis design team, comprised of UO Alumni, shared a deep passion and commitment to deliver a noteworthy project that would make an enduring contribution to the vibrancy of the UO campus.” Guided by feedback provided by the University of Oregon’s student body—which had requested a more user-friendly space with facilities for group work and peer-to-peer instruction—this project included a complete renovation and addition to an existing underground library. Roughly 25 percent of the university’s students and faculty are involved in the sciences and comprise the majority of the library’s user base. But because all students must take at least one science course, this library is a regularly visited spot. Atop a 48,000-square-foot underground library, the project added 4,000 square feet of new construction. Above grade, the team was able to add a true front door, which leads to a social commons surrounding another student-identified priority: a new coffee shop. Occupying a difficult site wedged between two buildings, sub-floor-to-high-ceiling windows illuminate the commons space with natural light. A new entry pavilion supplements a Brutalist courtyard that exacerbated the subterranean conditions of the existing library and maximizes available light below. A wood curtainwall sprouts organically in the courtyard, creating a calming forest atmosphere that completes the expression of light and nature. With student interaction a priority in its new space, the library intentionally downsized its collection; it now has approximately 80,000 science monographs in its stacks, which have a markedly smaller footprint. With additional bound volumes located in off-site storage, the overall reduction in printed materials made way for classrooms and feature spaces like the library’s MakerSpace and visualization laboratory. The decisions made by the university and the design team have paid off: Library use doubled in the first full term that it was open. Students and faculty have enjoyed the variety of spaces, with some students remarking that they had forgotten they were underground since the space no longer feels like a basement. 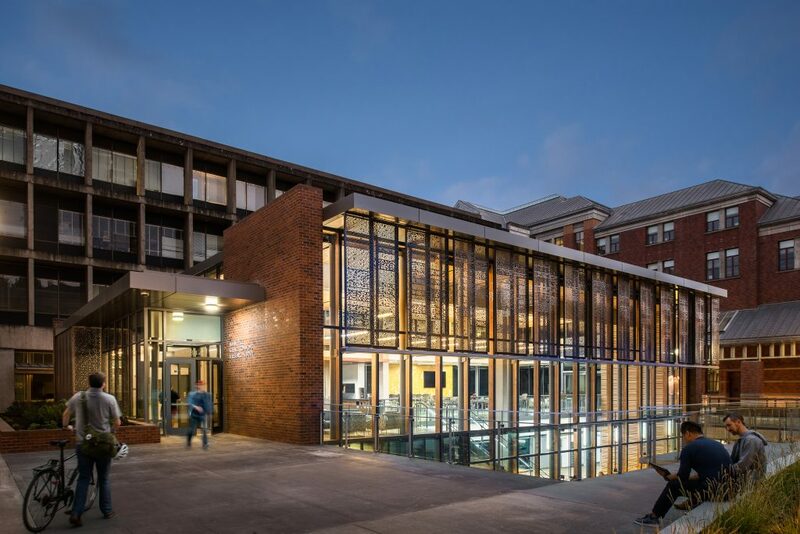 The project has won the American Institute of Architects and the American Library Association’s 2017 AIA-ALA Library Building Award; the Society for College and University Planning 2017 SCUP/AIA-CAE Excellence in Architecture for Building Additions or Adaptive Reuse Honor; and the 2017 American Institute of Architects Committee on Architecture for Education Facility Design Award of Excellence, (to be announced September 14, 2017).